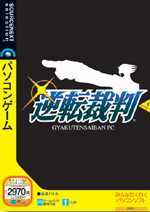 This was a Japan PC port of a popular lawyer adventure originally a 2001 GBA Japanese game. It first was done in English as an enhanced version on the Nintendo DS earlier in 2005. This PC version was released as 17 episodes. Take on the role of the titular Phoenix Wright, a rookie lawyer ready for his first case. Learn the ropes, carefully examine evidence, and if the solution doesn't seem to present itself right away, press your witnesses for more information until they slip up and create a contradiction with the evidence. Each case flips between two game modes: investigation and the actual trial. In the investigation aspect of the game, Phoenix gathers evidence and speaks to characters involved in the case. In the trial aspect of the game, Phoenix defends his client using said evidence, cross examines witnesses and solves the mystery surrounding each case. The court perspective is usually in the third person, while the perspective outside of court is in the first person. There are four cases in all. In 2019, an English version was included in Phoenix Wright: Ace Attorney Trilogy.